Maria Energia: Back to the Blogosphere! 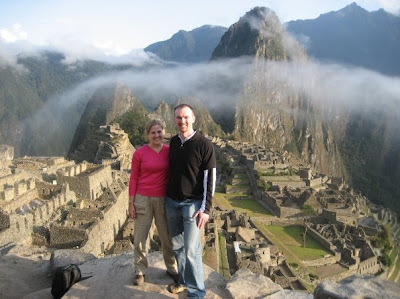 Our travels through South America were amazing - Chile, Peru, Argentina and Uruguay. We hiked, ate and drank our way through most of it, getting to know some locals too. My Spanish major from college still served me well, although I think I ordered "two round-trip bottles" one time instead of "tickets." Best waiter: Alejandro in Santiago, Chile. AKA the Latin Jake Gyllenhaal. When I told him he looked like the actor he replied "You must be yoking!" Best behaved stray dogs: Santiago, Chile. They patiently waited for the traffic signals like the rest of us and crossed streets appropriately. Best people watching: Santiago or Buenos Aires, where people were making out on every park bench and street corner. Really. Best leg of the trip: We immensely enjoyed all the places we visited, but the beauty and excitement of Peru already has us wanting to go back. Gasping for air and still not at the top of Waynapicchu, the peak 1 km above the Machu Picchu ruins. Our vacation from our vacation: Colonia, Uruguay was a great day-trip from Buenos Aires. Art in Buenos Aires. If you look closely you can see us reflected in the petal. One thing about Peru that I find curious is how easy it is to access the net (without a laptop) at one of the many cheap Internet cafe's. The cost of net access there (if one does not also have a computer at home) has to be a tiny fraction of what it is here - conservation thru shared use. Fred who conserves energy with a bicycle in Minneapolis.